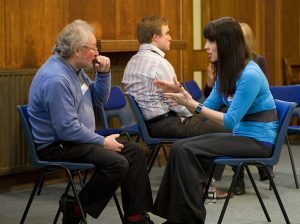 Would you like people in your organisation to have more effective interpersonal skills? Would more impactful inspiring leadership be beneficial? Would less conflict and greater team cohesion benefit productivity? Emotional intelligence (EQ) is the ability to be aware of and manage, ones own and other’s emotions. It is a crucial management and leadership skill-set with relevance to customer service, appraisals, sales… in fact any area that involves interacting with people. Emotional intelligence management is so important it is three times more likely to predict success than cognitive intelligence*. Our training effectively builds emotional intelligence skills in individuals and teams. This type of IE course really embeds the skills and makes a lasting difference. Shorter introductions are also available from half a day. For more information on our Emotional Intelligence Training call us on the number at the bottom of the page. View a few of our FREE Emotional Intelligence resources to give you a taste of our training courses.